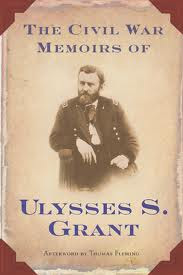 The Personal Memoirs of Ulysses S. Grant is an autobiography of American President Ulysses S. Grant, focused mainly on the general's actions during the American Civil War. Written as Grant was dying in 1885, the two volume set was published by Mark Twain shortly after Grant's death. These Memoirs have been highly regarded by the general public, military historians and literary critics. Grant was a shrewd, intelligent, and effective writer. He portrayed himself in the persona of the honorable Western hero, whose strength lies in his honesty and straightforwardness. He candidly depicts his battles against both the external Confederates and his internal Army foes. The autobiography is unusual but not unique in that large sections of Grant's life (most notably, his childhood and his presidency) are given brief mention or not discussed at all. The focus of the book is Grant's military career—his service in the Mexican-American War and the Civil War. Grant's writing has been praised for its conciseness and clarity—a sharp contrast from contemporary Civil War memoirs, which tended to reflect the Victorian fondness for elaborate (and sometimes overblown) language. It was a slow Sunday afternoon when some friends called up to see if we wanted to go to our small towns first of the summer community concert in the park that night. Friends and neighbors would be around and a little culture wouldn’t hurt so it was “why not”. 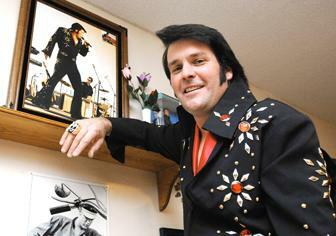 It turned out to be Elvis…..
Brad Boice from nearby Harmony, Minnesota (naturally) was the star attraction that night. I had never heard of him but my wife knew the family name having taught some of his cousins in high school. The story goes the Brad and some friends went to an Elvis impersonator show in Stewartville, Minn. One of his friends was unimpressed by the two Elvis wannabes and encouraged Boice to get up and sing. The other two had jumpsuits, but Boice had his voice. “I ended up getting a better reaction,” Boice said. Boice, saw it as an opportunity to get back into music. The Harmony, Minn., native had sung with hard rock band Gemini from 1979 to 1987. Gemini would throw in a little Elvis between songs by Ratt and Mötley Crüe. After he got married and had kids, it was harder to find time for music. Boice has always loved music. He has sung with his church choir and played tuba with the Chatfield Brass Band. These days, Boice concentrates on Elvis. 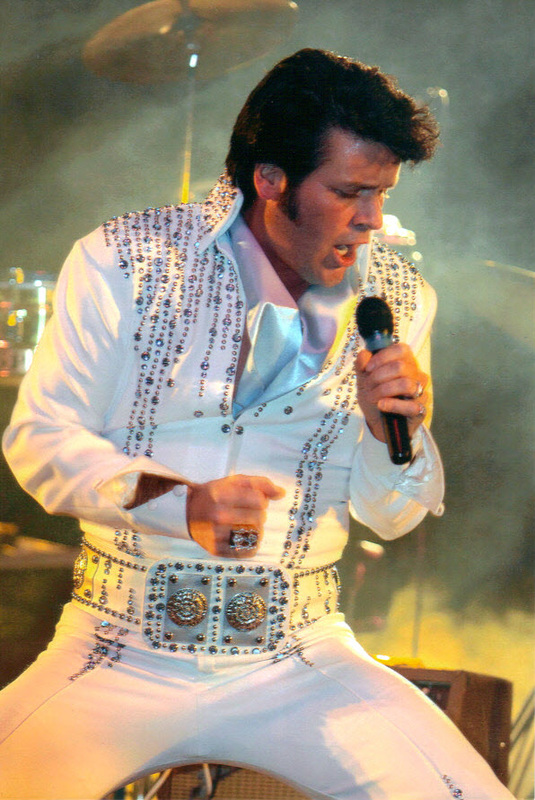 He watches old concert footage to capture the King’s signature moves. He listens to old recordings, trying to emulate his voice. Boice has won many Elvis contests and performed throughout the tri-state area. He has even starred on several Caribbean Cruise ships. I came late to birding in my life after having giving up upland game hunting due to a defunct knee. After an introduction to this new hobby by a good friend, I also thought it was an excellent opportunity to take my big GSD for long hikes in the countryside. And so it all began. Now I even look for books on the subject. A case in point is a wonderful new biography by Sue Leaf titled A Love Affair With Birds. I clearly remember my first successful outings in the 1960’s hunting pheasants, ruffed grouse and ducks. That’s approximately how Dr. Thomas Sadler Roberts, one hundred years earlier had done his work; gun and then, later, camera in hand, he traveled the state observing, collecting and describing birds and then finally writing, ” The Birds of Minnesota.” That two-volume set, published in 1932, is still considered the seminal and definitive account of the state’s wild avian population. Sue Leafs biography of Roberts, based on her nearly five years of research and interviews, describe him as a workaholic. He kept his Minneapolis medical practice going, which included delivering lots of babies and using any spare time to do his birding. 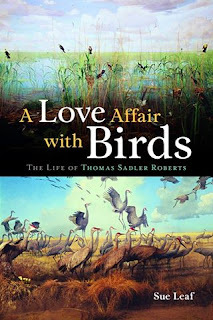 Roberts quit his medical practice at age 57 so he could devote more time to ornithology, although as Leaf points out, he never described himself as an ornithologist, instead calling himself a retired doctor. 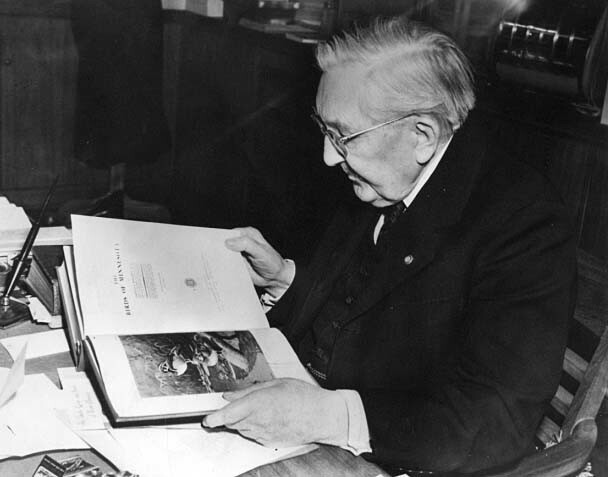 He became the first professor of ornithology (an unpaid position) at the University of Minnesota and helped create what would become the U’s Bell Museum of Natural History and devoted himself to educating aspiring classroom teachers about birds. Leaf’s book describes how this son of a privileged family from Philadelphia made Minnesota his home and excelled at medicine and ornithology at a time when the state was a magnet for white settlement and commercial development that altered the natural landscape that Roberts treasured. Thomas Sadler Roberts, gone now for nearly 70 years, left a legacy of appreciation for our state’s natural history and bird life. Anyone with an interest in birds, Minnesota’s natural history and learning about the fascinating life of a singular doctor, author, curator, educator, conservationist and bird enthusiast will find this book a rare treat. If there is any downer at all to reading this great biography it is this – there is a sadness to being taken back in Minnesota’s history to a time when the passenger pigeon still flew in our skies and other birds, now very rare or not seen at all, were a common sight….